Motor Corner has tutorials written by fellow member KE6GHS. More are soon to follow, older tutorials may be placed in zip files for downloading. The simplest circuit for remotely controlling a DC motor, is a relay for a basic on / off function. The following circuit expands on that design with 2 relays for forward and reverse. The circuit at left can be driven by most TTL level signals. Q1 and Q2 are not critical and can be almost any NPN transistor including 2N2222 or ECG123A. If the circuit is to be driven by CMOS, or, if the relays used have low coil resistance, Q1 and Q2 should be replaced by NPN darlingtons such as MPSA13's or ECG46's. The photo below shows a typical layout with 5 sets of the circuit seen at left. 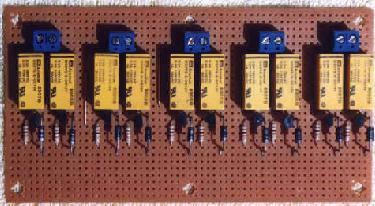 Relay circuit board for full control of 5 motors or 10 circuits. The next step in the evolutionary development of motor control is the transistor. The use of a transistor as a "low side" switch is the most common configuration. This means that the positive source goes directly to one side of the motor, while the "low side" of the motor goes through a transistor to ground. You can use either a bipolar or a MOSFET transistor in this capacity. If your current demand is low and your design can tolerate the voltage drop across the junction, then a bipolar transistor will work for you. Generally a bipolar power transistor such as the 2N3055 will be much cheaper and easier to find than an equivalently rated MOSFET. The disadvantages of bipolar include a high junction resistance in the "on state" which shows up as voltage drop and heat. A bipolar also has to be properly biased to prevent "thermal runaway" in which case the transistor destroys itself. A MOSFET transistor generally costs more than a bipolar of the same current rating, but offers several distinct advantages. The "on state" junction resistance of a MOSFET is quite low. It's not unusual to find a power MOSFET with an "on" resistance of .01 ohms. This means there will be negligible drop across the device and the transistor will run cool even when switching large loads. Also, they do not require biasing like a bipolar and are not subject to "thermal runaway". When operated within their design parameters, they are pretty much trouble free. The disadvantages of the MOSFET, are their higher cost and their handling precautions. Because they are a MOS device, they can easily be damaged by static electricity, although most devices today have built in protection. This drawing shows a simple "low side" switch employing a power MOSFET transistor. The device shown is from SGS Thomson. It comes in a TO-220 style case and is rated 50 volts at 12 amps with an "on" resistance of 0.1 ohms. Because these are high impedance devices, the 10K resistor is used to keep the gate turned off except when there is a valid high input. 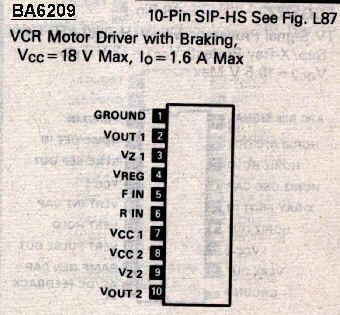 If you need more control of your motor than what a simple relay or transistor can offer, then the next step is speed control. This can be accomplished in many ways but the most widely used in hobby robots is Pulse Width Modulation, (PWM). This chart comes from the book," How To Design & Build Your Own Custom Robot" by David L. Heiserman. What it shows is how an average DC value can be changed by varying the duty cycle of a pulse that is creating it. For instance, suppose we have a pulse generator with an amplitude of 5 volts. If the duty cycle of that pulse is 100%, then the output would remain high the entire time and the effective output voltage would be 5 volts. If, however, we alter the duty cycle, or "on time" of the pulse to 50%, then the effective voltage is 2.5 volts. There are probably as many different ways to design a PWM circuit as there are people building robots. The following are a couple common examples I have found that work quite well. This circuit seems to pop up everywhere and for good reason, it's cheap, easy, and it works. This circuit using an NE556 timer chip is also from David L. Heiserman's book. With R1 set at 100K, the fixed frequency is 100 hz. With larger motors, this frequency may not be the most efficient, and in fact, the buzzing noise from the motors may be very annoying. Lowering the value of R1 will raise the operating frequency and may improve the performance. 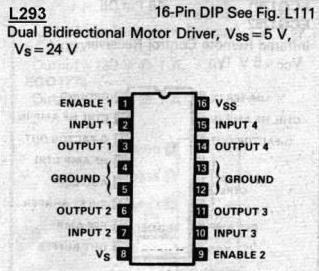 An added note to this schematics, there is only one 556 chip used in this circuit. For easy of layout this chip is shown in two sections. If you want full solid state control of your DC motors, then an H-Bridge circuit is the way to go. There are a number of H-Bridge chips on the market to choose from. With voltage ratings up to 80 volts, and current ratings up to 10 amps, there is almost certainly a chip available to meet your specific needs. There are several configurations of H-Bridges available depending on whether you need bipolar or MOSFET technology. They are also available with or without the control logic. Pictured below are some of the more popular H-Bridges used by hobbyists. The L293 is a dual bipolar H-Bridge with control logic. Supply voltage is 44 volts maximum with a 600ma current rating per channel. The L293DNE is a diode clamped version while the L293B is rated 1 amp per channel. Prices range from $6.59 at MCM Electronics to $1.48 at NetBuy. 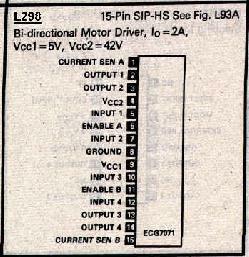 At the end of the article is a rather unusual circuit using the L293 to provide full motor control using only one pot. Drawings from Sylvania's ECG Semiconductor Replacement Handbook. All versions are rated 2 amps per channel at 42 volts maximum. Prices range from $10.15 at MCM Electronics to $2.56 at NetBuy. The BA6209 has been used extensively in VCR's over the last 10 years for control of the loading and reel motors. It is a single bipolar bridge with control logic and speed control. Due to it's popularity in consumer electronics, it is both easy to find and cheap. It can be found almost anywhere for under $2.00. Rated 1.6 amps at 18 volts it is both easy to use and reliable. The following bridge by National Semiconductor is kind of a strange animal so I list it in a category by itself. The LMD18200T includes bipolar, CMOS, and DMOS power devices on the same monolithic structure. It has an internal "charge pump" to raise the internal control voltages of the chip so that it will operate from TTL and CMOS inputs. It delivers up to 3 amps continous at up to 55 volts. Single quanity pricing can run $24.00. National has a new improved version of the 18200T called the LMD18245T. This device comes in a 15 pin TO-220 style case and is rated 3 amps continous and 6 amps peak current at supply voltages up to 55 volts. In addition to a lower price than it's predecessor, it also contains an innovative current sensing method that eliminates the power loss associated with a sense resistor in series with the motor. A 4-bit digital-to-analog converter, (DAC), provides a digital signal path for controlling the motor current, and, by extension, simplifies implementation of full, half and microstep stepper motor drives. For higher resolution applications, an external DAC can be used. The next group of devices are MOSFETS. It is rated 1.5 amps peak at 18 volts and comes in a variety of packages including 8 pin minidip and surface mount. The series comes in ratings up to 9 amps peak. Apex Microtechnology Corporation specializes in power IC's and their SA series should be of special interest to the hobbyiest building large robots. This series comes in an isolated 8 pin TO-3 case and contains all the circuitry needed for full control of a DC motor. The SA50 is rated 5 amps continous at up to 80 volts and has internal PWM. Single quanity pricing on the SA50 from Apex is $142.50. The SA51 has the same specs as the SA50 but without the internal PWM. The SA60 is rated 10 amps continous at up to 80 volts and has internal / programmable PWM frequency generation. Single quanity pricing on the SA60 from Apex is $134.95. You can check them out at: www.apexmicrotech.com or www.teamapex.com/. The next bridge, the LB1630, is an 8 pin minidip and is found in the Robbie Jr. robot by Tomy. While I have not been able to find the exact specifications on this device, I have successfully made use of it in my own robots. While I do not know the maximum ratings, I do know that powering a 12 volt 500ma motor does not even make it warm. Based on this single fact, I'm assuming it's a MOSFET bridge. I'm going to wind up this section with a smorgasbord of circuits and information I hope you will find useful, or at least educational. MCM Electronics, www.mcmelectronics.com, has a nice PWM speed control kit for DC motors. It is rated 10 amps maximum at 24 volts and includes everything but the heatsink. The part number is 28-6316 and it sells for $16.49 in single quanities. If you use hobby type RC servos in your design, you might find it useful to be able to operate them with a stand-alone circuit for design or troubleshooting. If so, then this circuit could be just what you need. This unique circuit comes from, "The Encyclopedia of Electronic Circuits Volume II", by Rudolf Graf. I would like to finish up by listing a couple of websites that have proven to be valuable resources when trying to find documentation on that elusive part. WZ Micro They carry several of the chips discuss in this article. I hope I have been able to provide some useful information for folks wanting to build their own robot. There are hundreds of great resources on the net but I have tried to fulfill what I see as a void in our hobby. I strive to keep my writing basic enough so the less experienced will not feel abandoned while still providing enough substance that even the seasoned pro may find something useful.